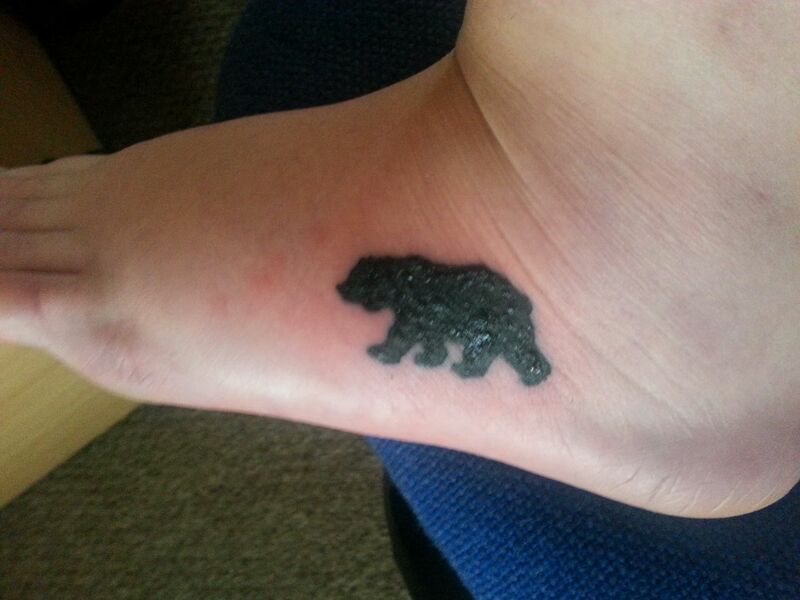 Earlier this year, I had a new tattoo done. I’m so pleased with how it’s turned out and I wanted to share my experience of getting and caring for a tattoo with the Internet. The picture above is pretty much the finished product, the artist is the very lovely Lucie Auker from Electric Workshop Tattoo in Peterborough. 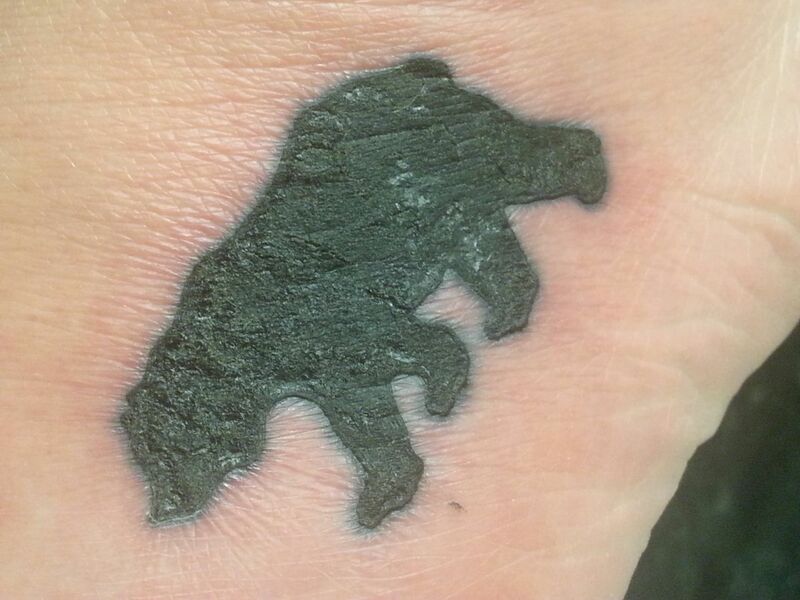 However, I’m writing this post because my sister had a tattoo done last November and it didn’t turn out quite so well. Mine however was pretty much healed within a week, the scabbing had flaked off and it was a bit itchy but it looked good. Looking back on my sister’s experience, I don’t think the tattoo was infected but she definitely had a bad reaction and had to go on antibiotics. I think the problem was, she didn’t keep the tattoo clean enough. If you do not wipe away the gunk and plasma enough in that first 24 hours you are setting yourself up for trouble later down the line because moisture on a technically open wound is going to create a breeding ground for bacteria. I also think another problem that contributed was that the tattoo was on her foot (a notoriously difficult place to heal) – oh and she also did a ten hour shift the day after getting it done. So here’s a quick guide, based on my personal experiences (please note that I am not an expert), on how to heal your tattoo quickly and easily. I don’t claim to be a know it all when it comes to body art – I am NOT an expert – but have been successful with healing my tattoos – however I hope this helps anyone out there maybe looking to get their first tattoo or wondering about the healing process on one they recently had done. 1. First, ensure your artist is reputable and the shop is welcoming, clean and can answer any questions you have. If you can smell disinfectant when you enter that’s a good sign. 2. Make sure you research your design, know exactly what you want and that your artist is suitable for the job. 3. Don’t choose an artist because they are cheap. That saying ‘you get what you pay for’ is very true. 4. Book a day off after the tattoo to ensure you can rest properly after having it done, your body goes through a lot of pain and trauma. 5. I think having a tattoo done feels like epilating. I’m not going to lie, it is a little painful but after a while the area goes numb and you kind of forget about it. Be prepared for discomfort but try not to panic too much. If you know you don’t cope well with pain consider having yours in a place that is less receptive to it such as the thigh, arm or back. 6. Wrists, feet, stomach, neck and especially ribs are all delicate areas that a lot of people struggle with. Tattooing on bone is also pretty painful. 7. Take a bottle of water with you and make sure you’ve eaten at least a couple of hours before getting your tattoo done. 8. Wear clothing or footwear that won’t restrict or rub your tattoo after it’s finished. 9. Most shops use plastic wrap on tattoos, keep this on for around 2-4 hours after you get home. You will notice lots of ink and liquid underneath the wrap, this is called plasma (which is white blood platelets rising to the surface of the skin to tackle the wound) and is important in the healing process. 10. When you change your wrapping give your tattoo a quick wipe with some warm water. Make sure you wash your hands before doing this. Re-wrap your tattoo with cling film and leave for another 2-4 hours or until there is lots of plasma build up again. 11. Take ibuprofen every 4 hours throughout this process. I also took one-a-day anti histamine just to reduce any chance of a bad reaction. 12. After 24 hours your body should have rejected most of its plasma, now it’s time to take the wrapping off and let your tattoo get some air. 13. Don’t apply cream yet. Lots of people will be telling you to start slapping cream on but it’s best to let your tattoo dry out for around half a day. 14. Do not submerge or soak your tattoo in water for the first couple of weeks, you want to ensure that as much ink gets into your skin as possible. Showering is okay, just don’t stand with your tattoo directly in the water. 15. Once your tattoo is dry, and no more plasma is leaking out, start applying cream. Use the tiniest amount, just to cover the tattoo and make it look a little shiny. 16. Keep applying cream throughout the healing process. Whenever the tattoo looks a little scaly and dry pop some more on. On the first couple of days your tattoo will be red and swollen – don’t panic. 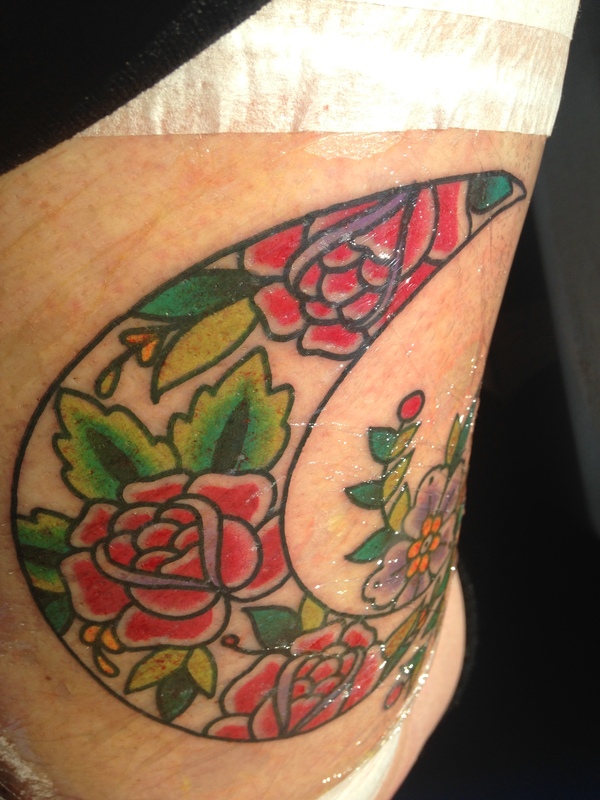 During the first week your tattoo will feel like sunburn and feel tender and hot for a few days. A tattoo that heals well won’t scab heavily – think of a scab that you used to get when you fell over and scraped your knees, you don’t want that on your tattoo. However, there will be a very layer of light scabbing that will flake off after the first week, although everyone heals differently so it might take longer for this to develop and flake off for some. When this light scabbing occurs your tattoo will itch – badly – try your best not to manically scratch it. Tap the skin or scratch lightly around the tattoo. Itching is a good sign, it means the body is healing. If you do end up with heavy scabs – tattoos with lots of black ink can result in them unfortunately – do not pick or smother them with cream. Too much cream can suffocate the skin, ruining its natural healing processes and picking the scab can lift the ink and damage your skin. Ensure you have clean bedding – beds are harbourers for germs. Drink lots and lots of water and if you drink alcohol in the first week drink more water to compensate. Take ibuprofen regularly to reduce swelling. Let your tattoo get as much air as possible – if you can avoid wearing clothes over it do so. Apply the tiniest amount of cream when you first start moisturising. I used E45 cream, it’s worked well for my tattoos and by the time mine has healed I’ve got through a whole tub. …take some anti-histamine tablets and seek medical attention, head to the walk in centre or your GP. Don’t just hope it will get better, it’s very hard for tattoos to get infected (or so I’ve been told by a tattoo artist) but they can get angry and aggravated and the end result can be ruined if scabs form. My sister has had her tattoo retouched since and it looks so much better now but she could have avoided that return trip if she had followed the steps above. Have you had a bad experience with a tattoo? Are there any tips you swear by?